A question I get a lot from people headed out to Napa or Sonoma is “what winery should I visit?” Ideally you want a place that is gorgeous, with wines that match, and Ferrari-Carano definitely fits the bill. TripAdvisor consistently mentions the gardens at Ferrari-Carano as one of the most beautiful in California wine country, and the winery itself as a “must visit.” You’ll almost feel like you’re visiting a Chateaux in Bordeaux! Almost. But beyond scenery, the wines at Ferrari-Carano’s Dry Creek Valley winery in Sonoma are world class, and surprisingly affordable! This week’s feature, for example, is available for less than $20 everywhere, but is an excellent expression of Italian Sangiovese with a California twist. 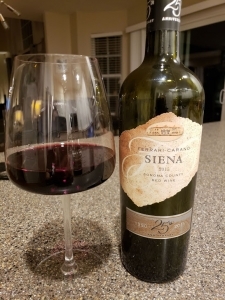 The 2015 Siena is a blend of Sangiovese with Malbec, Petite Sirah and Cabernet Sauvignon, a sumptuous mix of grapes providing cherry and raspberry flavors, blackberry, leather and vanilla aromas, and an oaky dark chocolate finish that contrasts perfectly with the fruit. I really liked this wine! It’s deep and rich, nicely balanced, and got 90 points from Wine Spectator. You can also feel good about buying it, since Ferrari-Carano is a Certified California Sustainable Vineyard, protecting the fragile ecosystem and preserving the 1,400 vineyard acres for future generations. 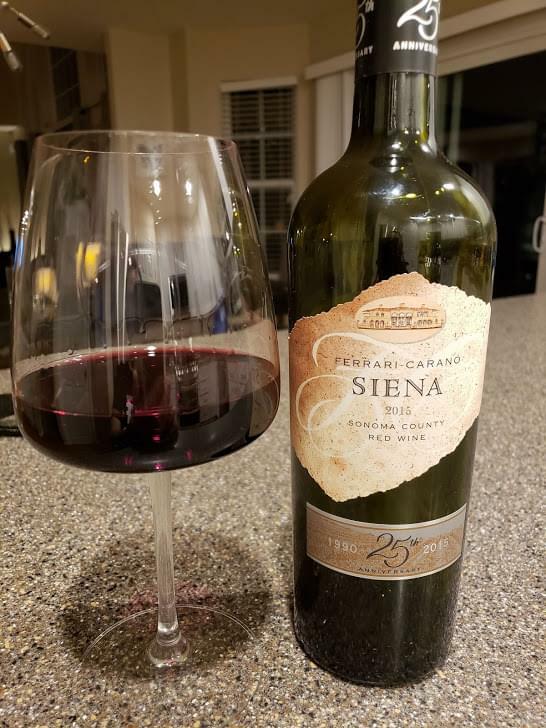 On my five-cork scale based on taste and value, the 2015 Ferrari-Carano 25th anniversary Siena gets 4 corks! You should be able to find it locally for around $18, and it’s worth every penny.